This catalogue, compiled by just three individuals over the course of the first half of the twentieth century, captures on one typed card per manuscript letter the basic metadata (for example, the names of the author and/or sender and the recipient, the date the letter was written, the location it was sent from, the language it was written in, and the shelfmark required for retrieval, together with a brief abstract summary) for a large portion of the Bodleian Library’s holdings of early modern correspondence. Although in 1927, when work on the catalogue began, it was intended to be no more than an index to the correspondence of Thomas Hearne, subsequently it was expanded into what became known as the ‘Index of Literary Correspondence’. Digitized in 2010 during the course of first phase of the Cultures of Knowledge project and made available in the beta version of the union catalogue, this collection of library finding-aid cards is now accessible within EMLO to researchers worldwide. The scanning and keying of the 48,817 cards represented in EMLO was supervised by Alexander Huber and Michael Popham from the Oxford Digital Library, while editorial work on the metadata was performed by the Phase I Cultures of Knowledge editors, Miranda Lewis and Kim McLean-Fiander. EMLO would like to thank Professor Richard Sharpe for his constant and invaluable advice at every stage during this undertaking. 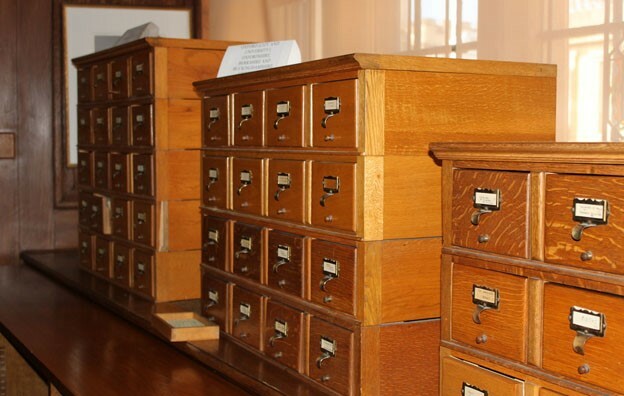 A great deal has been learned from this process of digitization of the Bodleian card catalogue, lessons EMLO would be more than happy to share; for further information and advise about scanning, keying, and digitizing similar catalogues, please contact us. Compiled between 1927 and 1964, the letters described in this catalogue range from the early sixteenth to the early eighteenth centuries and span 321 years. Although significant numbers of the itemised letters are scholarly in nature and were written in Latin or English and sent within the British Isles, as one might expect at the height of the early modern era vast quantities of the letters listed on the cards were dispatched to and from Europe in a myriad of languages that range from Dutch to Hebrew, German to Greek, French and Italian to Spanish. Two Bodleian staff members — Kate Pogson (1888–1968) and James Henry Hall MInn (1870–1961) — and one remarkable volunteer — Colin Bertram Hunt (1881–1967) — worked through more than 487 guardbooks in total and captured the basic metadata for a staggering 48,691 manuscript letters, together with an informative, at times expansive, and often entertaining abstract summary of each letter in English. Whilst EMLO is not able to provide images of the manuscripts, it was decided during the first phase of the Cultures of Knowledge project to mount the scans of the cards themselves within the catalogue so that these might be rendered accessible — along with their digitized and fully searchable summaries — to scholars and library users worldwide. Whilst editorial ‘tidying’ work on such a massive collection continues to this day, digitizing the cards has brought a finding aid that was previously accessible only to those with a Bodleian reader’s card to the attention of the public at large and has highlighted a number of hitherto little-known letters. It has enabled, in addition, significant keyword and content searches to be conducted. The Bodleian Library contains correspondence from a large number of epistolary collections, many compiled shortly after the date the letters themselves were written. The Library’s holdings of the Rawlinson, Tanner, Smith, Ballard, and D’Orville manuscripts are particularly well described in the cards. It must be borne in mind that none of the three compilers was a trained librarian and whilst they made every attempt to create accurate records, the cards contain a number of errors and inconsistencies. A number of known issues have arisen as a result of the intial ingest process and we, at EMLO, are working hard to resolve these. One such issue involves the miscapture of the Roman calendar dates. Another is with language of the manuscript letter: with the majority of the cards, the language is English unless otherwise stated; there is, however, a small number of cards that do not have a language specified and are not in English — these need to be identified and the correct language recorded. There is also a problem with the some of Tanner collection records: the date of the year has not been captured on the original card and this needs to be added. Over the course of this year, EMLO will be holding a number of workshops and ‘correct-a-thons’ to address these problems; should you be interested in getting involved in any way, please be in touch to find out more. Work to proofread and tidy the metadata is ongoing and at this point the help of all scholars who consult the catalogue in the course of their own research would be appreciated greatly. Please send us your comments as they arise — each correction and addition received plays an invaluable part in this editorial process and it is with your help that we will hone and refine this invaluable resource to perfection. Miranda Lewis, ‘Ghosts in the Machine: (Re)Constructing the Bodleian’s Index of Literary Correspondence, 1927–1963’, published online 26 April 2013 [http://www.culturesofknowledge.org/?p=295].